You may like Halloween but not want to or not be able to wear a Halloween costume. Perhaps you work somewhere where a costume would be inappropriate or impractical. Maybe you'd rather leaving Halloween costumes to the kids, but you still like to be a little festive. Whatever the reason if you want to show some Halloween spirit even though you aren't wearing a costume here are 10 Pinterest pins for Halloween outfits that are not costumes. Wearing a bit of Halloween fashion is great way to acknowledge the holiday even without a costume. 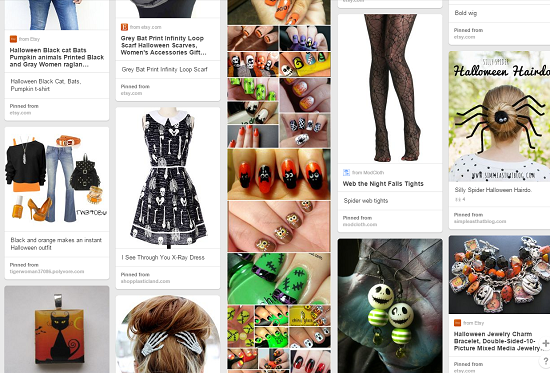 For more ideas follow my Halloween Fashion board on Pinterest. 2. Wear a normal outfit, but put a Halloween accessory in your hair. 3. Wear a basic dress or skirt with some Halloween tights or leggings. 4. Wear some spooky jewelry. 5. Or go with some Halloween jewelry that isn't so spooky. 6. A Halloween scarf also works well. 7. For something a little bolder, find a normal article of clothing that uses a Halloween print fabric. 8. For a casual look, get a cool Halloween t-shirt. 9. Try some Halloween nail art. 10. If you are feeling really daring, wear your normal clothes with a wild wig. When anyone asks about it say, "What wig?" For the month of October, Listing Beyond Forty is Listing Toward Halloween, featuring posts related to or inspired by Halloween. Read all the previous posts here. Don't miss any of the Halloween series! Get notified of new posts by email. My list is completely spam free, and you can opt out at any time. For more Halloween fun, follow @halloween4all on Twitter or Halloween Queen on Facebook. For more eclectic social media shares follow Kim Z. Dale on Twitter and Google+ and like Listing Beyond Forty on Facebook.